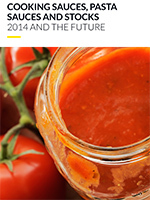 This global annual market overview will provide you with an in-depth review of the key issues in the global cooking sauces, pasta and stocks market through 2014 as well as our forecast for what will happen in 2015 and beyond. Globally, 2014 has been a strong year for cooking sauce sales. The main growth driver has been in emerging economies where the combined benefits of improving retail infrastructures and busier working families demanding ever more convenient meal solutions is significantly driving cooking sauce consumption rates. While many Western markets are showing signs of economic improvement, this has yet to result in a tail off in convenient meal solutions such as cooking sauces. Apart from a few notable exceptions, cooking sauce markets in developed economies also continue to show steady value growth. However, it will be of concern that four of the leading cooking sauce markets by value, Japan, Australia, Korea and Italy are all forecast to show year on year volume declines. However, rather than suggesting a potential ceiling for sauce consumption, the driver behind these falls is more to do with changing dining habits where more adventurous consumers are ditching traditional staples for a wider range of global foods. Taste adventure is the main driver for cooking sauce growth in most other markets.